Maintain Healthy Vitamin D Levels. 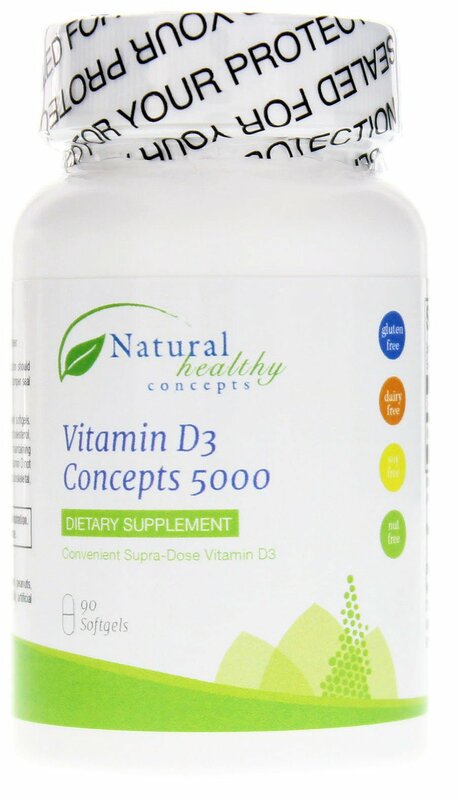 Viitamin D3 Concepts 5000 from Natural Healthy Concepts maintains healthy levels of Vitamin D in the body. Nicknamed the “sunshine vitamin” by many people, vitamin D is primarily obtained from ultraviolet B rays. It is an essential vitamin for optimal health and supports bone and dental health, immune system health, cognitive health, and more. With Vitamin D3 Concepts 5000, you can experience the potential benefits of vitamin D3 for yourself. These vegetarian capsules offer a bioidentical form of the vitamin D that the body naturally synthesizes. It supports bone health, dental health, healthy immune system function, cardiovascular health, and more! Vitamin D3 Concepts 5000 Product Details. Vitamin D3 (cholecalciferol) supplement. Delivers 5000iu of D3 per serving. Supports bone and dental health. Supports healthy immune system function. May support cardiovascular health. Supports cognitive health. Contains 90 softgels. If you’re looking for a vitamin D3 supplement that offers a number of potential benefits, consider Vitamin D3 Concepts 5000 from Natural Healthy Concepts. Other Ingredients Other Ingredients Organic extra virgin olive oil and softgel (bovine gelatin, vegetable glycerin, purified water).